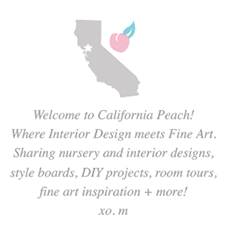 California Peach: Welcome to California Peach! 2. Featuring Designs Inspired by Fine Artists, both past and present. 4. Offering Clients a way to visualize a room and or artwork in a room through Custom "Style Boards"
5. Offering Clients room organization layout Tips and Advice. 6. Offering Clients Unified Designs and easy links to all items to ease ability to make this room a reality! Please see the ABOUT section for more about www.california-peach.com! Thanks & hope you enjoy dreaming & designing with me! Love this Mary! Guess what, that is almost EXACTLY what we are going for in our nursery! LOVE! So excited to see more of what you come up wiht. you are so creative. Disney Pixar's UP - Feebies!! !